Around the world and in U.S. cities, the Occupy Movements were taking place. (Our Scope) The Occupy Movement is an Open Source platform of advocacy any social domestic issues. 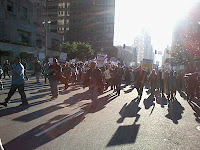 On Thursday November 17, 2011 the 99% protested the 1% in Downtown Los Angeles. 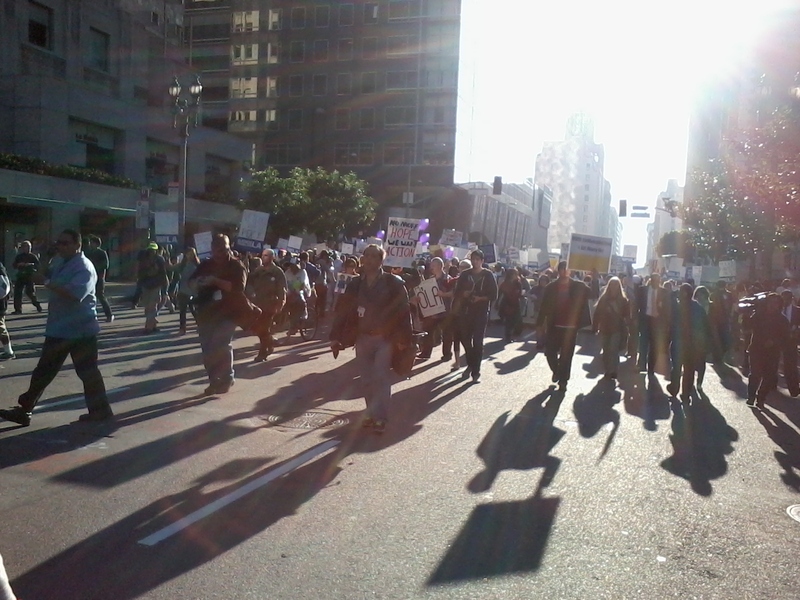 People, signs and motivating chants marching for good jobs in Los Angeles and the Responsible Banking Ordinance. A peaceful march of solidarity for one purpose, "the right to exist." Now meet Bertha Jordan, in the pic below an older woman wearing glasses, with the bini knit cap. Bertha Johnson an 82 year old African American woman, she was the first arrest that day. What's important about this woman being the first arrest today, as Rosa Parks' role helped establish the Civil Rights Movement and now in our time of the Occupy Movement, another courageous woman is still protecting her children - speaking out against injustice, upon her natural leadership. This is what Democracy looks like "Bertha Jordan!" Never met this woman personally. I just so happen to snap this photo while marching; not knowing in moments she was on her way to jail for demonstrating her Freedom of Speech and Right to assemble. When I saw her being escorting into custody, in my eyes I witnessed true courage. Thank you Berth Johnson for continuing the legacy of strong women, who nurtured and protected many children and taught us to do what's right. Thank you see you "Every Thursday" Be disruptive and you might be next.